Grandpa told me several times about his uncle who was a doctor who had a beautiful horse that he thought the world of. When people would comment about her, he would respond, "when she goes, I'm going with her." One Sunday afternoon the family was having a family gathering and the doctor got a call to go see a patient. His mother was on the front porch of the house when the doctor was leaving driving his horse and buggy, and his mother called to him what a fine horse he had and on how much he thought of her. He replied, "when she goes, I'm going with her." There was a bad electrical storm while he was traveling back home from the call, and the horse was struck in the top of the head and killed by lighting. The lighting also traveled down the reigns and killed the doctor. That is what I remember of the story from Grandpa. I found in the Ohio Historical Society library, a newspaper article that gave an account of the incident and learned these additional facts. His father was traveling with him and he was knocked unconscious and fell on top of the horse. He came to just in time to hear his son speak his last word, and see him breath his last breath. This obituary is recorded in the Mt. Gilead newspaper of the day. Grandpa told it to me several times when I was growing up so it was exciting to find a verifying article in the Mt. Gilead newspaper. 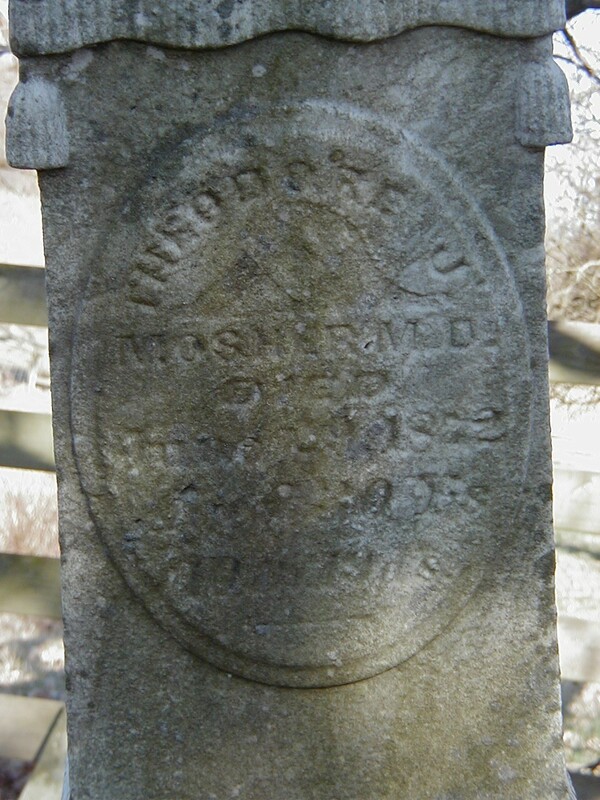 Dr. Theodore Mosher is buried in the Buck family cemetery just north of Fulton, Ohio. He was born August 9, 1841, and died on June 28, 1872. He served in the Civil War in the 15th Ohio Volunteer Infantry as a medical steward, and practiced medicine in and around Mount Gilead, Ohio after the war. We learn that Dr. Mosher, who, for some time had been engaged in the practice of medicine at Olive Green, Delware County, Ohio, when on his return from a visit to a patient at Pagetown, in the county, in company with his father, Mr. D.W. Mosher who resides at Emery's Corners, for miles south of this place, was struck and killed by lightning on Saturday last. The horse attached to the buggy which they were in, was instantly killed, and Mr. D.W. Mosher was so badly shocked that he fell from the buggy - on to the horse - and returned to consciousness just in time to see his son breathe his last and hear him speak one word. Dr. Mosher's remains were bro't to this county, near his father's residence, for interment, and funeral exercises were conducted by the Masons, of which order he was a member. His Loss is a sad one to his friends and relatives in this and Delaware count, where he is well and favorably known.